Welds up to 1/8 in. (3.2 mm) thick steel. All-in-one 11,000-watt generator and 225-amp welder. You get a generator and welder for about what you would pay for just a generator. Smooth arc starts with minimal "sticking". Extraordinary motor starting characteristics. Strong continuous rating to run compressors, pumps, lights, hand tools and other equipment. Provides stamina and long dependable service. Enclosed design, large battery, rugged electrical connections and wiring, and circuit-breaker protection. Just over 3 ft. long and weighs less than competitive units. Has a 12-gallon fuel tank and low oil pressure shutdown as standard features. Dependable engine conserves fuel and provides long operation before refueling. Help maintain scheduled routine oil servicing (every 100 hours) and other preventative maintenance. Easy to set up and start welding. 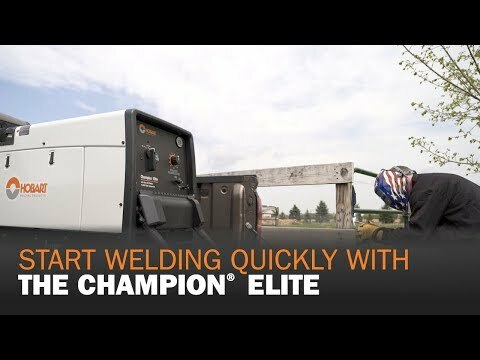 Primarily designed for the Stick process, the Champion ELITE also provides a smooth arc for scratch start DC TIG welding. Consists of 50 ft No. 2 electrode cable with holder, and 50 ft work cable with clamp. 200 Amp, 100% duty cycle. The versatile Champion® ELITE welder/generator is the quietest, most compact welder/generator on the market. Learn more about welder/generators including what applications they are good for and typical process capabilities.